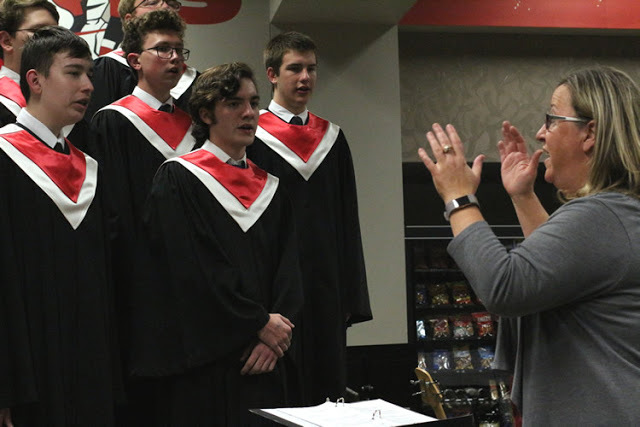 The Mount Michael choir and jazz band put on an awesome concert for family, friends and staff in the Student Union. The choir started the night off singing a capella Star Spangled Banner which they had also performed at several home basketball games. They followed up with The Chariot Spiritual, The Flying Dutchman, and Goodnight, Sweetheart. 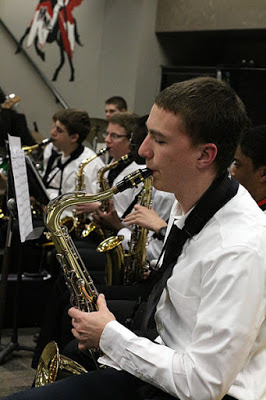 The Jazz Band played three pieces, It had to be you, It Don’t Mean a Thing, and Moondance. The selections this year were challenging pieces which they handled wonderfully. Their hard work and challenging material should serve them well at the upcoming district competitions. Trevin Detwiler, Adel Elbendary, Patrick Fayad, Christian Fletcher, Joshua Snyder, Nicholas Snyder, Blake Worsham, Jack Blaser, Ming Hint Chui, Jimmy Crotty, Skyler Davis, Jackson Heller, Trenton Sedlacek, Jimmy Severa and Kaleb Stavneak. Armel Mignondje, Addison Cousin-Hardrick, Cole McNally, Ben Keller, Levi Kicken, Matthew Collins, Cameron Detwiler, Ian Kim, Lincoln Badley, Jacob Gathje, Trevin Detwiler, Daniel Davies, Joshua Davies, Trenton Sedlacek, John Tuttle, Jack Blaser, Ming Hint Chui, Qixuan Ding, Max Swiniarski. The first two choir songs did not record due to operator error.